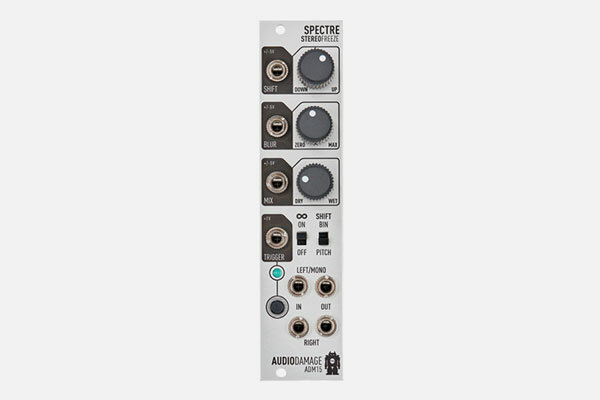 The Audio Damage ADM15 Spectre module allows you to freeze and mix FFT spectra (Fast Fourier Transform). The module’s audio path is true stereo. The frozen frequency spectrum can be shifted up and downwards in two distinct modes of operation. With BIN shift the shift is linear (similar to frequency shifting) while the PITCH shif mode is capable of harmonic transformations. The BLUR control adds noise to the frozen FFT frame and adds stereo decorrelation and blurring effects.